Ogeyi Place Hotel (Formerly Le Meridien Ogeyi Place) is a modern hotel located at 45 Tombia Street, GRA Phase II, Port Harcourt, Rivers State, Nigeria. It is located in the serene business district of the oil-rich Niger Delta Region. The comfortable and beautifully designed interior and features complement the magnificent and amazing view of the exterior. Ogeyi Place Hotel (Formerly Le Meridien Ogeyi Place) has a total of 86 stylishly furnished rooms and suites of varying categories. Categories of rooms available in this hotel are the Diplomatic Suite, Deluxe Room and Executive Suite. 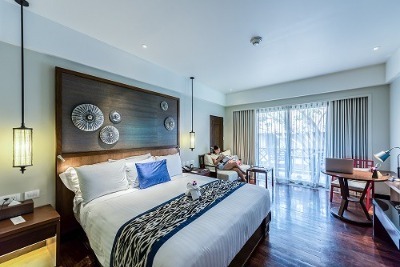 These rooms are fully air-conditioned with Hypo-allergenic premium bedding, minibar, espresso maker, iron/ironing board, cable TV, in-room safe, washer/dryer, telephone and a clean private bathroom with shower/tub combination, toiletries, dryer, bathrobes and slippers. Some of these rooms have a City View or a Pool View. Continental breakfast is served daily at a surcharge. Connecting/adjoining rooms are available for families. A couple of modern and awesome facilities are available at Ogeyi Place Hotel (Formerly Le Meridien Ogeyi Place). These facilities include: the Ororo Restaurant, with a buffet serving style and international cuisine, where guests will not just enjoy delicious delicacies but also experience a refreshing feel (Smoking is not allowed here and dressing style is Business Casual); the Ororo Bar, serving snacks and cocktails, grants you a poolside feel(Dressing style is casual and smoking is not permitted); a free Wi-Fi internet access, an outdoor pool; a fitness centre and spa; and a 24-hour front desk service. It offers additional services to its guests which include: daily housekeeping, ample parking space, laundry/dry cleaning, hair salon, luggage storage, express check-in/check-out, conference and meeting rooms, and 24-hour business centre. At Ogeyi Place Hotel (Formerly Le Meridien Ogeyi Place) security procedure is top notch with security personnel around the premises round-the-clock to ensure the safety of its guests. Q: Does Ogeyi Place Hotel (Formerly Le Meridien Ogeyi Place) have a restaurant? A: A restaurant is available at Le Meridien Ogeyi Place. Q: Does Ogeyi Place Hotel (Formerly Le Meridien Ogeyi Place) have on-site parking? Is it free? A: A free parking lot is available at the hotel. Q: Is there a fitness centre/gym at Ogeyi Place Hotel (Formerly Le Meridien Ogeyi Place)? What type of equipment are available? A: Yes. A fitness centre/gym is available at the hotel. Q: Does Ogeyi Place Hotel (Formerly Le Meridien Ogeyi Place)have a swimming pool? Q: Does Ogeyi Place Hotel (Formerly Le Meridien Ogeyi Place) offer free Wi-Fi? A: Free Wi-Fi is available in the hotel for all checked-in guests. Ogeyi Place Hotel (Formerly Le Meridien Ogeyi Place) is hotel in Port Harcourt, Rivers. I had a gorgeous stay. No problem at all. Keep it up! My stay was good. Although there was a slight delay before we were checked in. But afterwards I demanded to speak with manager and eventually we were checked in to our respective rooms. I paid out of my nose for this reservation but did not get any breakfast. I have paid way less elsewhere and gotten a complimentary breakfast before. This is embarrassing for your hotel, to make your guest pay so much and not get full value for their money. Have nice pictures of Ogeyi Place Hotel (Formerly Le Meridien Ogeyi Place)?